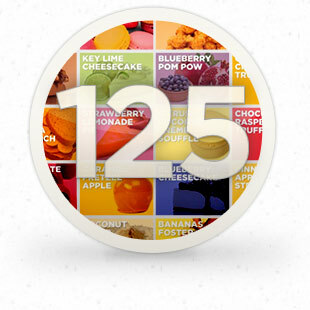 The top 15 flavors of frozen yogurt account for more than 85% of the volume in the self-serve market. However, having more than 15 flavor options keeps your shop exciting and your customer's interest higher. Other manufactures offer 70 to 80 flavors, which only serves to increase your costs. Honey Hill Farms has developed a flavor strategy that keeps the manufacturing, distribution and inventory costs low, passing the savings on to you. At Honey Hill Farms, we don't produce flavors for the sake of having something new. We strategically choose the flavors we produce to maintain our high standard of quality, create new sales opportunities for you and keep your costs down. 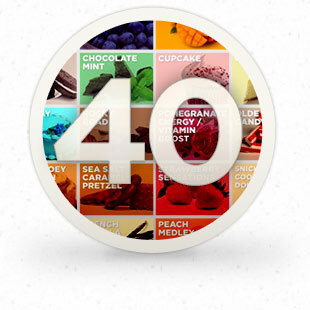 We produce 40 delicious premium premixed flavors including standard favorites such as our Tahitian Vanilla, Strawberry Sensations and Dreamy Dark Chocolate to our mouthwatering exotic flavors such as Sea Salt Caramel Pretzel, Candy Bar Smash and Zeusberries. We also produce a line of Nonfat/No Sugar Added frozen yogurts and Nonfat Tarts. Annual Flavor Plan Strategy – Our shop partners get an advanced preview of the annual flavor line in order to create a calendar flavor strategy without the guess work. Spring/Summer & Fall/Winter Flavors – Rotate out of season flavors and replace with season-appropriate flavors without adding extra costs. Holiday Flavors – Promote special holidays and increase sales. CustomBlendz is our custom flavoring system that allows you to create your own unique frozen yogurt flavors. 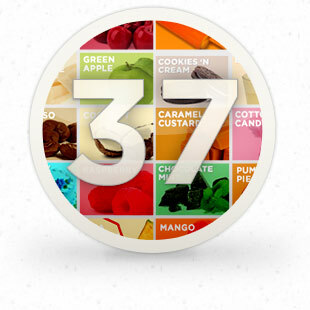 With 37 CustomBlendz No Sugar Added flavors, your options are endless. Our CustomBlendz flavors are made to mix with any of our Nonfat Tarts, No Sugar Added Nonfat Tahitian Vanilla or Sugar Creek Plain Base. Simply add 2 ounces of flavoring to one gallon of yogurt base and let your soft-serve machines do the rest. It's quick, easy and clean. Most frozen yogurt shops fail to utilize the middle handle of their soft-serve machines, but we've carefully matched and tested combinations using our 40 premium premixed flavors to create an additional 125 flavor profiles simply by using the middle twist handle on your soft-serve machine. We've even given the twists names so you can easily market these incredible combinations to your customers. Join the Honey Hill Farms Partner Program and you'll receive the Honey Hill Farms Twist Chart and colorful twist flavor tags to entice your costumers. Learn more about our flavor strategy for your shop by contacting us today!